Bug Shot of the Week is one of two fundraising series that promotes photographers and youth programs on St. Croix, US Virgin Islands. When you Pay What You Want (PWYW) for the featured photo donated by the featured photographer, you’ll also be contributing to the Pushing Daisy Drive, and other youth programs. The “Bug Shot of the Week” Series features the exceptional photography of Ras Lumumba Corriette of Ay Ay Eco Hike & Tours. His love for nature shines through in every one of his shots of insects, flowers and nature in general. In May of 2015, long time friend Ras Lumumba, sent me an email entitled Zulu Queen Daisy in my Flower Garden. In the first sentence he writes, “Miss Daisy, your mother, ‘The Zulu Queen’ has chosen to resurrected in my garden. In fact, she looks so Majestic in her regal garments…” With such a powerful photo and statement, there was no way I could put “Week” after this Bug Shot. Enjoy! 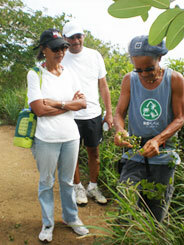 Ras Lumumba, owner of Ay Ay Eco Hike & Tours, is a master Gardner, Herbalist, and Environmentalist. He has been conducting educational walking tours, teaching gardening and the use of medicinal plants for nearly 40 years. His fun and insightful way of teaching, story telling and engaging his participants in the ethnobotanical, cultural, and historical folklore of the island make his hikes and tours unforgettable. You will learn the Latin and local names of all the plant life you encounter, as well as their properties and uses. If you plan to visit St. Croix, US Virgin Islands, don’t miss the opportunity to take one of his hikes or tours! Go here: Eco Hikes and Tours by Ras Lumumba.